A colorful bilingual (BG/ENG) catalogue Anguish and Salvation. The Remembrance of the Jewish Communities in Rousse, Shumen and Varna, by European Spaces 21 Association is already published. The catalogue reflect materials from the mobile exhibition and the project Anguish and Salvation. 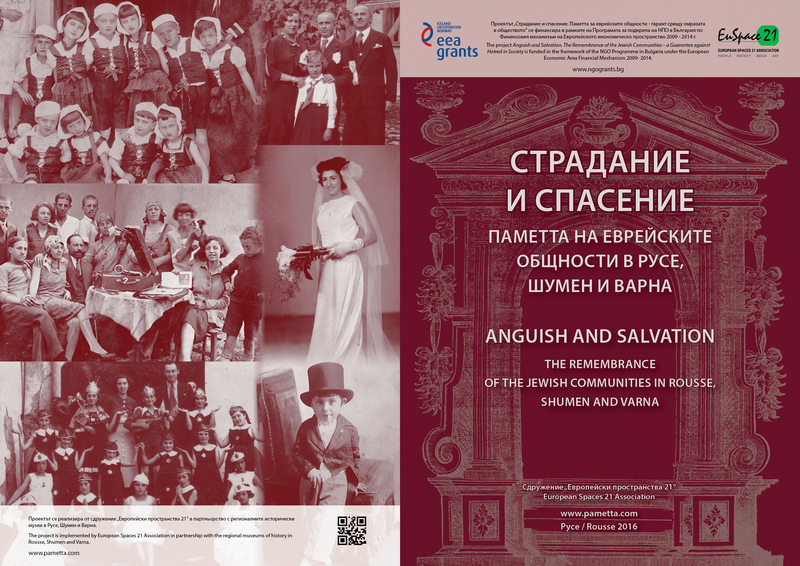 The Remembrance of the Jewish Communities – a Guarantee against Hatred in Society, funded in the framework of the NGO Programme in Bulgaria under the European Economic Area Financial Mechanism 2009- 2014. Author and complier of the catalogue is prof. Nikolay Nenov, Editor Tsveta Nenova, English interpreter Miglena Parashkevova. The book is rich in illustrations and visual materials, donated to the team within the filed ethnology research, held among the Jewish communities in Norther Bulgaria in 2015. Materials are included from the State Agency Archives Sofia, regional archives from Vidin and Rousse, and also Rousse Regional Museum of History. The catalogues is disseminated to scientific institutions, universities, museums, libraries and archives in Bulgaria, Europe and United States. You can read the catalogue here – click on the cover picture.